Star Trek Reviewed: (214) Fan Mash-ups and Recuts. (214) Fan Mash-ups and Recuts. Attention: Any fan of Mash-ups and Recuts who wishes to create "Star Trek Reviewed -- Mash-ups and Recuts" I would be delighted to turn this page into an index for your website, rather than have this disorganized page here. This is a listing, not yet in any particular order, of fan recuts I have found. In some cases, it's a You Tube channel with many, in some cases it's just one recut. Some are carefully constructed original stories, others are little more than re-edits for what the cutter thinks is humor or other effect. Recut tries to tell the story of the JJAbram's prequel comic, Star Trek: Countdown, https://www.youtube.com/watch?v=bmFTuuC3fa0 (5:42). 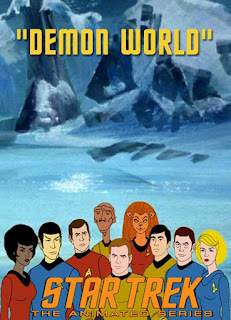 A pilot/proof of concept, "Demon World," for a proposed series, TAS Continues. The producer is looking for animators interested in working on a non-recut series. This pilot episode combines artwork from TAS and voices from a 1990s video game, https://vimeo.com/194298845 (11:39). 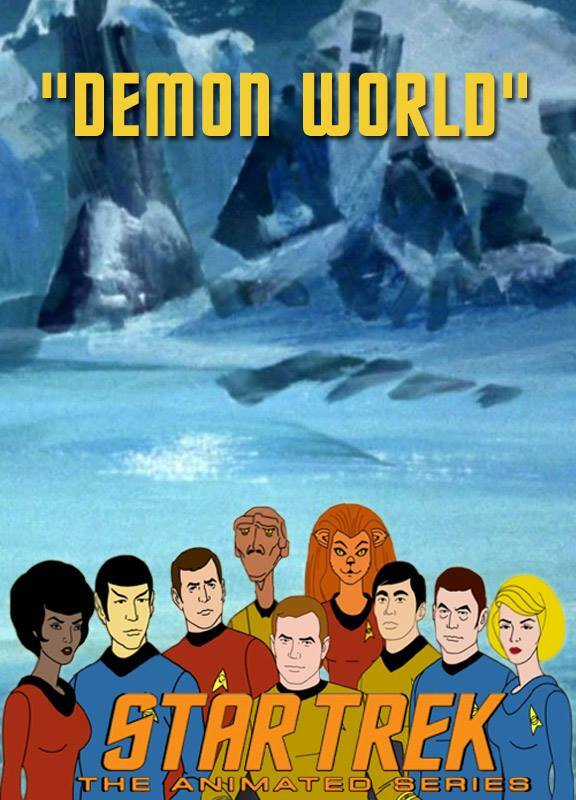 TAS Parody Mash-ups, "Kirk Squad,"
more than a dozen others at his home page: http://www.youtube.com/user/skarovision#p/u . They do not seem to tell stories. TNG Recut: 146 Retribution http://www.youtube.com/watch?v=ftztUbaaz_k&feature=related (6:13). You Tube Channel: http://www.youtube.com/user/GeneralGrin has at least 153 TNG recuts. This re-edit is by www.SevenSouth.com. It has the popular name, "The Lost Episode." Channel that posted (but did not create) it: http://www.youtube.com/user/Felfy39#p/u . It's clearly from more than one TOS and TAS episode. This poster has other mash-ups on his channel as well. There seem to be a whole set of these by different You Tube Accounts, Star Trek: The Next Generation, The Sitcom. One is already in the Parody/Comedy group. http://www.youtube.com/user/snackpeelskin#p/u Married with Children, http://www.youtube.com/watch?v=97U0lpU5v7Q&feature=related (14:14) This is largely a recut of a single episode. The plot is barely changed, but the tone is adjusted and condensed. Not a bad job. Here's an entire series with two seasons, "Star Hood Trek"
Season 1: http://www.youtube.com/user/djkage#g/c/084D0939B3BD493B 8 episodes, 2 to 6 minutes each. Season 2: http://www.youtube.com/user/djkage#g/c/A74153B2C41A32FD 9 episodes, 2.5 to 10 minutes. At least some of these boarder on the obscene. The Worf of Starfleet (parody of the trailer for The Wolf of Wall Street) http://www.youtube.com/watch?v=E_sUtXAl24o (2:14). Star Trek Inferno (Romulan Empire Video) Trailer for a movie. Star Trek: Starring Guy. Guy inserts himself into TOS footage for an original (very short) story. https://www.youtube.com/watch?v=ymuGxf2aVZI(3:37). A recut of Star Trek Into Darkness, transferred to Black and White as a silent film. Star Trek: Grimlock Edition. Offensive recut of TAS. Star Trek 2399: https://www.youtube.com/watch?v=UGbYauz1In4 (1:51) (trailer for imaginary TV series). For others from the same filmmaker, see https://www.youtube.com/channel/UCoT47pVI3i_8z2HcIdottJA. Bedank2309(reassimilated) https://www.youtube.com/watch?v=zx8AyEmk_Tk (5:00) Recut mixed with commentary.